Kishor Alo May 2016 (laughter edition) free ebook pdf file. Kishor Alo- is the best Bangla monthly Patrika by Prothom Alo in Dhaka, Bangladesh and edited by Anishul Haque. It is very beloved of all over Bangladesh and also India. Readers can get a pdf copy of edition March 2016. 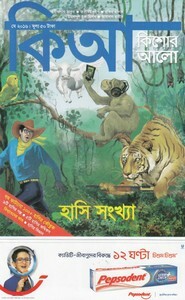 This edition cover stories are about the subjects- laughter, stories, juvenile poem, comics, funny memory, funny story, funny science, Mojaru etc. Readers can read or view free ebook pdf of Kishor Alo May 2016 edition.